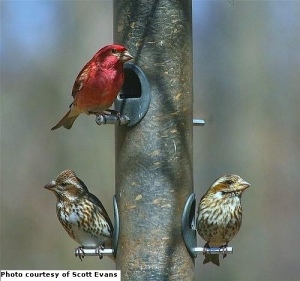 In fall 2007, two incidents of purple finch, Carpodacus purpureus, mortality involving 4 -5 birds each, were reported from mainland Nova Scotia (NS). One finch was submitted for post mortem examination from one location, and two finches were submitted from the other. The submission included immature and adult and male and female birds. They were all emaciated, and one finch from each location had a severely ulcerated and necrotic lesion in the oral cavity and/or esophagus. The tissue damage was of sufficient severity to have substantially reduced ingestion of food and possibly precluded eating entirely. Therefore, this would have been the primary cause of their poor body condition. Microscopically, Trichomonas sp., a protozoan parasite, was identified as the cause of the lesion. Individuals who are interested in monitoring for the occurrence of trichomoniasis and/or preventing the disease from becoming a problem at their bird feeders can refer to the Garden Bird Health Initiative or the Royal Society for the Protection of Birds for further information. Information includes clinical signs and spread of the disease as well as recommendations regarding prevention. (modified from the CCWHC Spring 2008 Newsletter, 13-2). 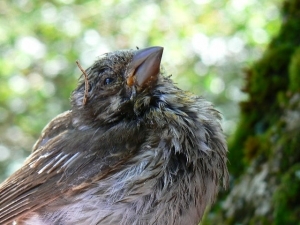 A purple finch from Cook Brook, NS, was diagnosed as having died of trichomoniasis on early July, 2008. Since then, 4 other finches from various locations in Nova Scotia, 1 finch from PEI and 2 finches from New Brunswick (see map) have been examined and diagnosed with trichomoniasis. The finches from New Brunswick were American goldfinches, Carduelis tristis, not purple finches. Purple finches dying of trichomoniasis were noted in NS last year, but, similar to the pattern reported in Great Britain, the mortalities occurred in late summer and early fall. The problem appears to be occurring earlier this year. We would like to encourage investigation of finch mortalities and submission of suitable specimens for cause of death determination. Also, we would be interested to hear about purple finch mortalities that might be occurring in other provinces in Atlantic Canada. We are in communication with Veterinary Pathologists in Nova Scotia, New Brunswick and Newfoundland and Labrador, in an effort to monitor this problem more effectively. Please contact Scott McBurney, Darlene Weeks or Maria Forzan if you have any information or want to submit a finch for necropsy, or call the CCWHC Atlantic at (902) 628 4314. I live in Columbia, TN and believe 2 house finches from my yard feeders have died from trichomoniasis. I am removing all feeders and bird bath for one month. I hope this will be enough. I have read three weeks. We have been recommending 2 weeks, though taking them down for longer during the summer months shouldn’t be detrimental to the birds. The idea behind taking down the feeders for two weeks is that it causes the birds to disperse to find new sources of food and water. In so doing you are keeping from infected birds and healthy birds all congregating around an available and accessible food source where the disease can then be easily spread through direct contact or through food and/or water. Another way to reduce the likelihood of disease transmission is to only use feeders that keep seed dry (the parasite cannot persist for prolonged periods on dry food), change water frequently in baths to keep it clean, and regularly disinfect all feeders and baths.